Anyone can walk down the aisles of Michael’s and come home with pre-made items. True, that person had to keep kids away from all the low-hanging merchandise and escape with some credit left on her card. The point, of course, is the street cred that comes with making something on your own. 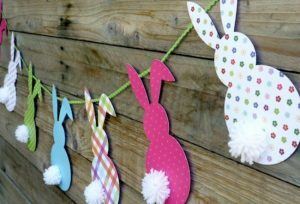 That’s why I’ve picked 10 of the CUTEST and EASIEST do-it-yourself Easter decorations this side of the internet. The first is one I call The Tree. Yes, I’m a bit short on creativity this morning. That’s perfectly all right, though, because all I need for this craft is some sticks, something to jab them into, and Easter decorations like hanging eggs. I suppose I could go all cutesy and make sure the sticks are in a bucket with grass. Whatever floats your Easter boat is good with me. 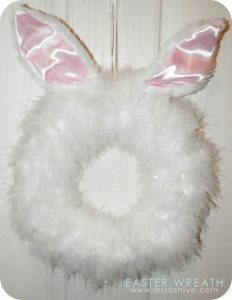 You can’t tell me this fluffy bunny wreath didn’t make you laugh out loud. Tell me you at least smiled. 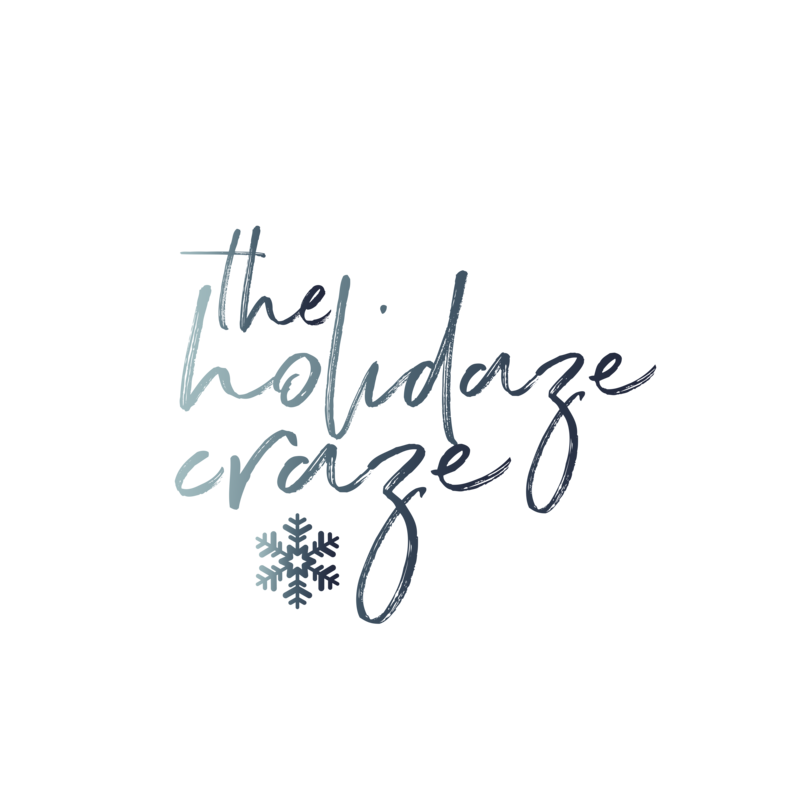 It can easily be yours, or made as a thoughtful neighbor present, at the low cost of a wreath frame, bunny ears, white feather boa, and a glue gun. Maybe you’re more of a socks person. I know I am. 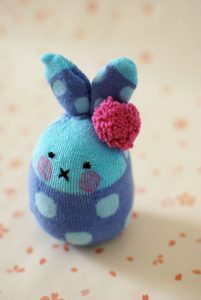 Instead of wearing a cute sock, today we’re going to turn it into a bunny. It’s also a simple craft, like I promised. You’ll need a sock (preferably clean), batting, sewing skills, and cheek-coloring marker skills. I’ve also seen these stuffed with a plastic egg instead of the batting. I love glue guns. 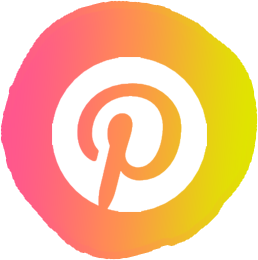 If you’re not aware by now, they are one of my standard go-to’s for homemade items. 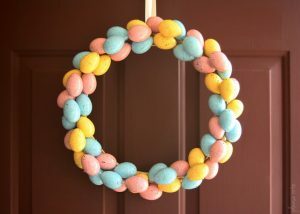 Take this egg wreath, for example. 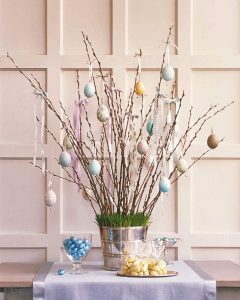 If you’re going with it instead of the white fluffy one, all you need to do is glue a ton of plastic eggs to a straw or styrofoam wreath. You can go ahead and make it more difficult by painting the eggs first, but All a Dollar already has a ton of colors if you want to be lazy. 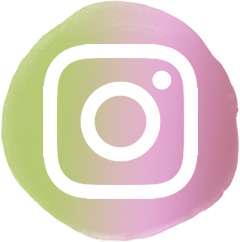 Do your kids like papier-mâché? Well, they may just like this hardened-string craft that also begins with a balloon. Unlike the goopy mess of flour and water, however, this involves wrapping said balloon in yarn and rolling it in a special sugar water bath. This is done at least twice after drying, to ensure the yarn gets stiff. Just before the bottom is completely dry, your future basket will need to be set upon some waxed paper to flatten its bottom. Then, the basket shape is cut out, lace is added, and you feel the overwhelming sense of pride one gets with a job all done. 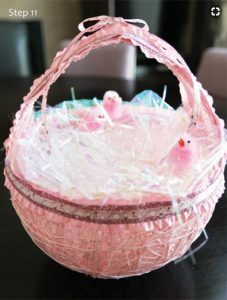 You may not think Easter DIY could extend to something like a birdhouse, but why not? 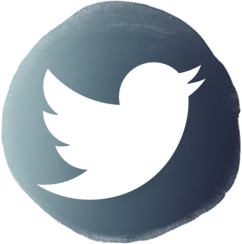 Birds are part of the springtime of Easter. Découpage-ing springtime paper onto the outsides will further silence any naysayers. The birds will be happy, too. I couldn’t have just any banner for Easter. I suppose we all knew that “outside the box” was the norm after the bunny ears wreath, right? 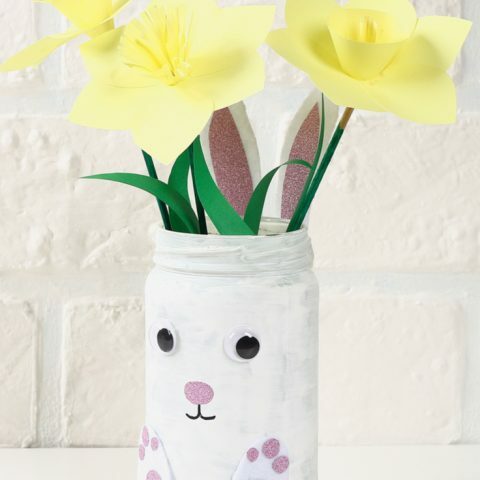 At least this one is clearly DIY Easter. I mean: bunnies. They’re probably Easter bunnies. 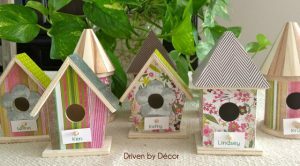 As with the birdhouses earlier, your choice of paper is going to help bring spring ideas into play. Do not, for the love of rabbits, forget to stick their tails on at the end. Have you seen people decorating with topiary lately? I remember writing about some around Christmastime, but hadn’t thought to try Easter ones. 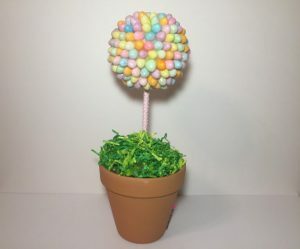 They’re another basic project, and a good way to use any leftover jellybeans. 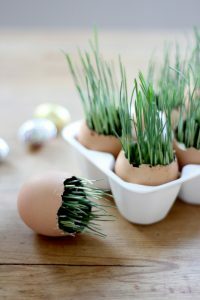 For a decoration that’s natural, trendy, and still easy, try this sprouted wheat one. As you can see, their “pot” is a cleaned-out eggshell. 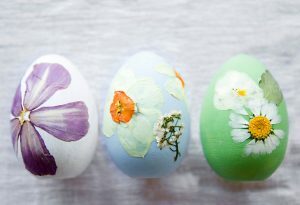 You can paint the shells before planting, or go au naturale. My favorite idea using all-natural elements was with pressed flowers. The flowers look painted on, but they’re real. It’s all due to the magic of Mod Podge. 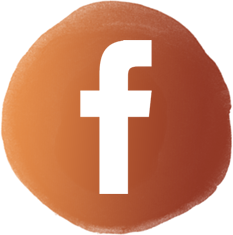 If your garden isn’t growing yet; pick your flowers up from a bouquet at the florist, or pick your neighbor’s buds when he’s not looking.